With distance education, students can benefit from a varied curriculum without trekking to school or sitting in a classroom. While a physical shared learning space does offer many unique benefits, distance learning allows all students to get the education they deserve, no matter where they are. Without geographic limitations, varied and personalized curricula are literally at our children’s fingertips. Distance education is remote learning, which allows students to attend a class without physically being in a classroom. Today, this usually means being part of a course that is given over the internet. Distance learning courses can be pre-recorded with all of the materials uploaded in advance, or they can require participation at particular hours with live streamed lessons. Is it better to do distance learning at your own pace? While the option of learning at your own pace might be enticing, it also requires the individual student to take responsibility for completing course work. Even in courses where there are no due dates for most assignments, there is often a final date when all of the work needs to be completed. If there are no specific deadlines for completing assignments, it can be tempting to push everything off to the last minute. This might be too much responsibility for a high school student to handle. A responsible parent, teacher or advisor needs to help students figure out how to set a good place so courses are completed. Online classes that are given through live streaming are much more similar to a classic classroom model. They might require active participation, and allow students to enjoy the social aspects of learning as well, because they still have the opportunity to get acquainted with the other students in the course. This model also allows the teacher to build relationships with the students and provide more personalized assistance as well as structured classroom discussions. If a student has a question about an assignment, rather than E-mailing and waiting for an answer, they can simply ask the instructor during the lesson. What are the benefits of distance learning? 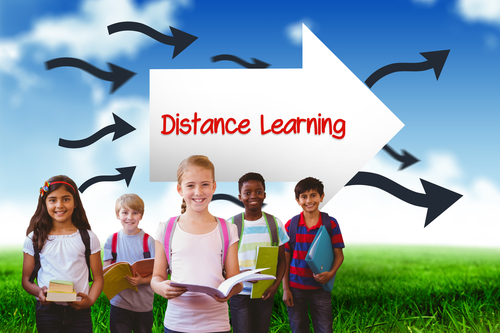 Distance learning is particularly beneficial to students who live in geographically-isolated areas where there are limited school choices. Rather than having to suffer through a long daily commute or move into a dormitory, students can just log on to the computer and enjoy whichever courses they want. This is also a great option for students who are travelling for extended periods of time during the school year or relocating in the middle of the year. Sometimes traditional schools use distance education when there are students who need a particular course but the school does not have enough room in the budget to pay for a whole class. A school can set up a video conference connection with an instructor in another location and share the costs with other schools who are doing the same, or allow students to enroll in a course individually. Another benefit is the ability to access high-quality instruction no matter where you are. Sometimes the challenge in geographically-isolated areas is not funding the teachers, but finding qualified educators who are able to come to a particular location. When you are not limited by geography, you can find the best candidate no matter where you are. Distance education has a lot to offer. It allows all students to have equal access to high-quality education, no matter where they live. Without geographic limitations, our students can enjoy any courses they want, and even learn at their own pace, according to what they choose.